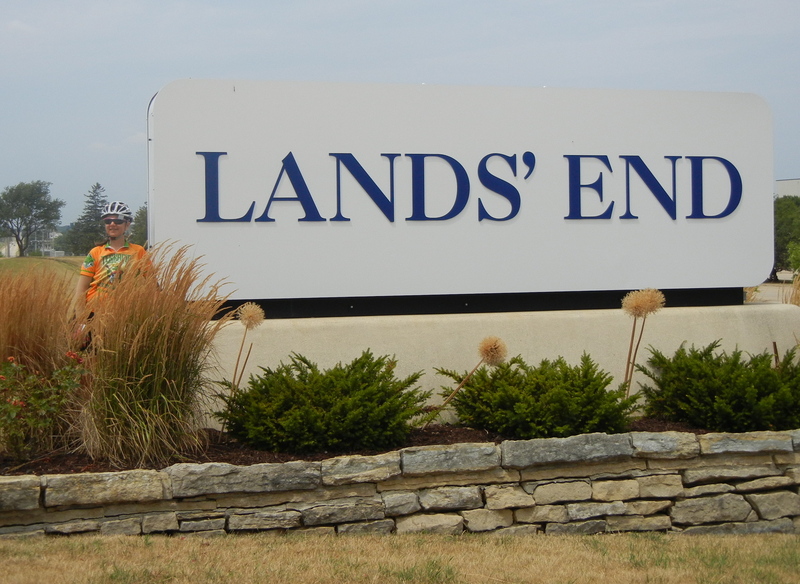 Today’s ride destination is Dodgeville, which savvy internet and catalog shoppers will note is the home of Lands’ End. (Yes, the apostrophe is in the right place.) 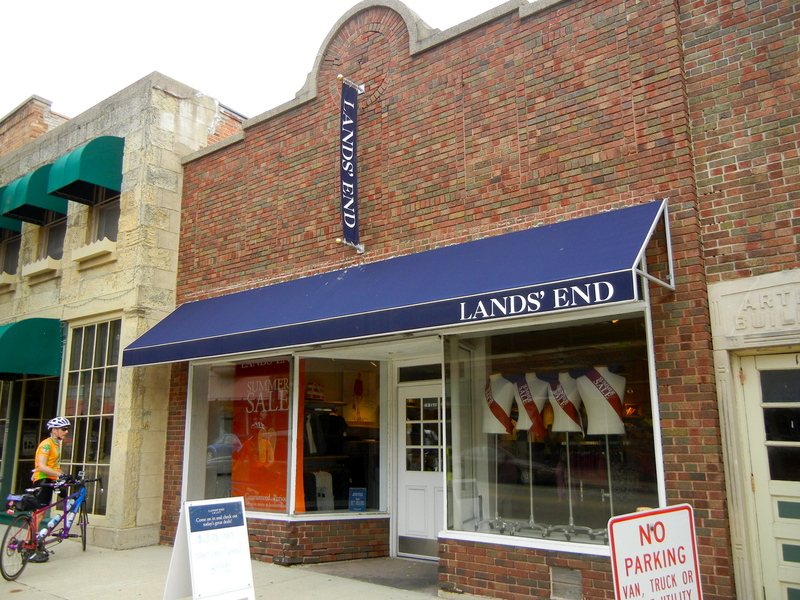 Lands’ End has a huge company headquarters here as well as a small retail store on the main drag. You would think the store right down the road from company HQ would be bigger. Eve shows off the latest in corporate sign design. Across the street from the Lands’ End store is, you guessed it, a bakery. The Quality Bakery has been there since 1928 and we sample their wares. 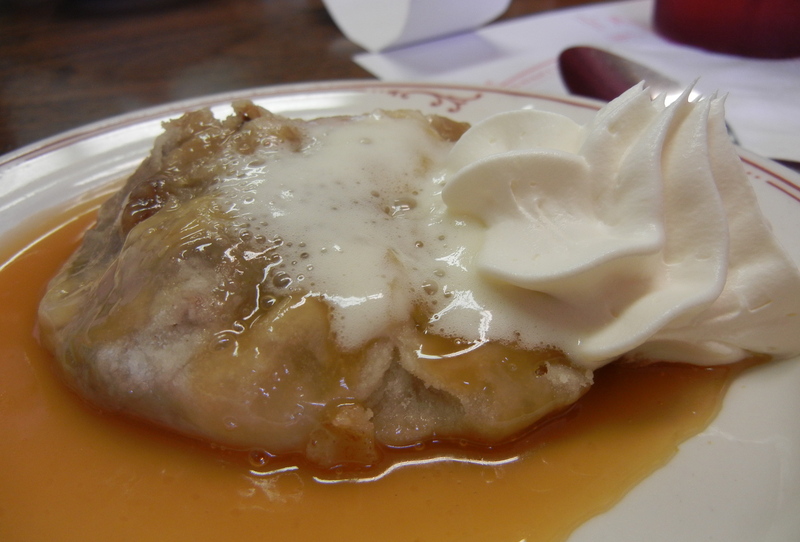 They are famous for their bismarcks, so we get one of those to eat and a rhubarb pastry (sorry, Claudia) to eat later. 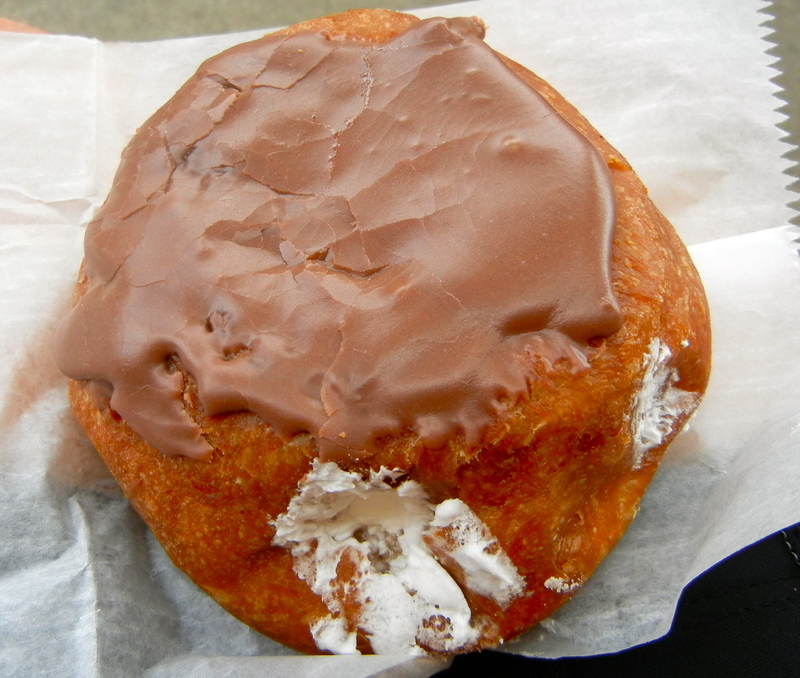 This bismarck tasted more like a doughnut than yesterday’s did. It’s important to be able to compare. We also pick up a small bread to eat with cheese in the next few days. The roads here are not numbered. They are “lettered”, so you will ride on County Road K or County Road CH. Today we ride on a lot of letters, including roads X, Y, and Z. We climb 3800 feet during our 46-mile ride, making this the toughest day of the trip. A Wisconsin cheese factory. 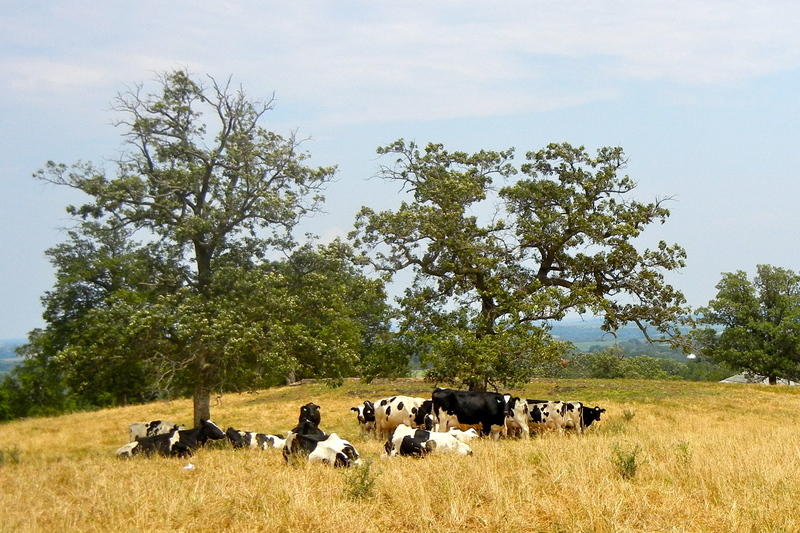 These cows are going to audition at Chick-Fil-A. There is a raging headwind for the last 8 miles or so. It is so windy that we can’t talk to each other without major shouting. For those keeping track, we have ridden 300 miles in the first week of the trip. Although I wipe it down daily, our bike is filthy and it’s a good thing that Mark L. is 800 miles away and can’t see it. On to lunch, where we eat the local food at a local restaurant. A local resident took this picture of us outside of a local restaurant. 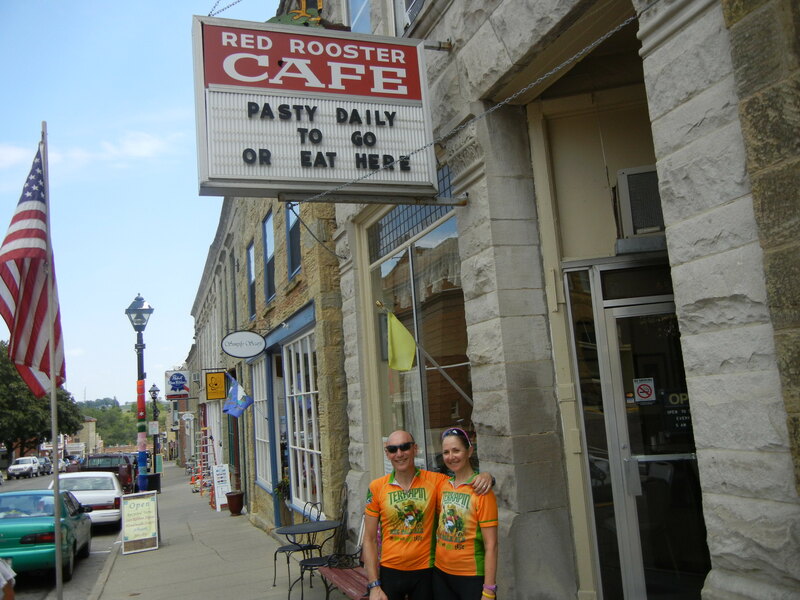 The Cornish people settled the town of Mineral Point in the 1830’s and one of the things they brought with them is pastys. It’s like a meat pie, but drier because they took these down in the mines for lunch. 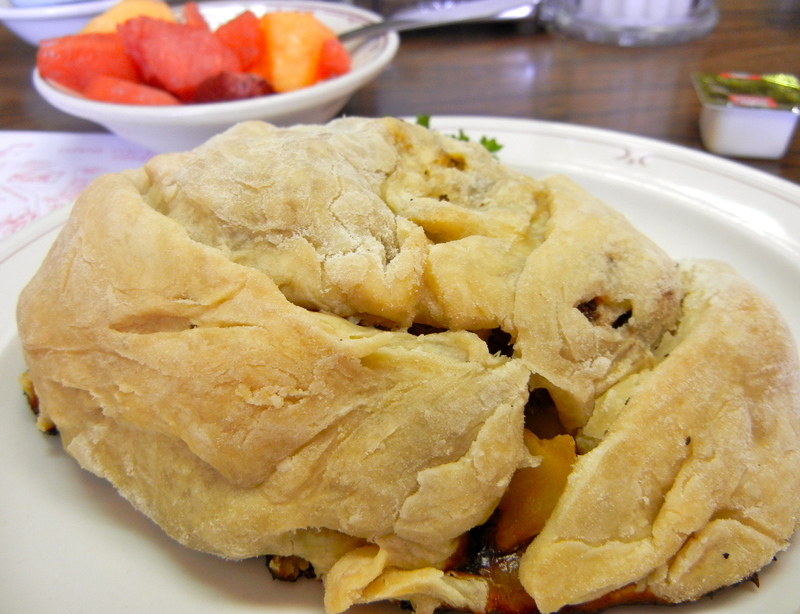 The Cornish pasty (pronounced “past-ee”). Now you know. 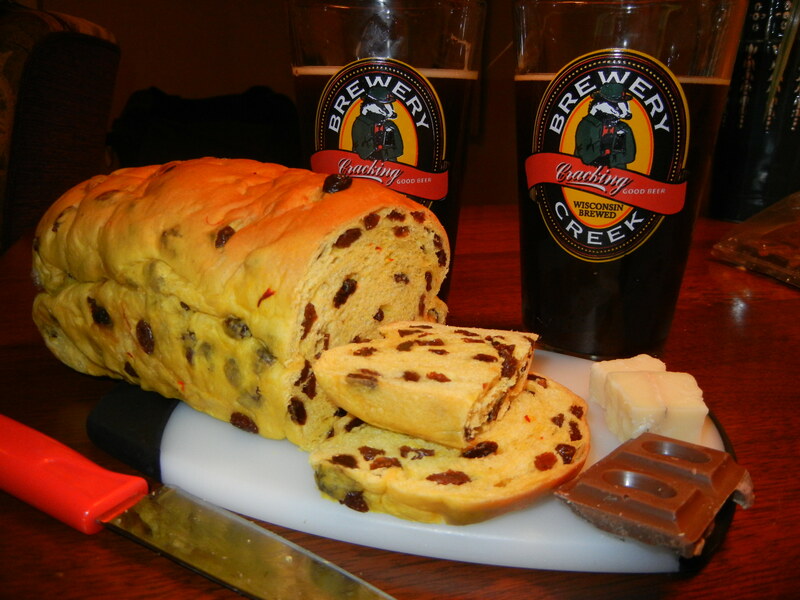 Another specialty is figgyhobbin, which tastes a lot like a cinnamon raisin bun. We don’t think the miners took this with them into the mines. This is what a figgyhobbin looks like. After lunch we clean up and drive to Galena, Illinois, which is about 40 miles away. Our friend Mags McDee has insisted that we go to Galena, and it’s hopping on a Saturday afternoon. Once a lead mining town, Galena is now mining money from tourists. There are a lot of tourists and the shops are bustling. 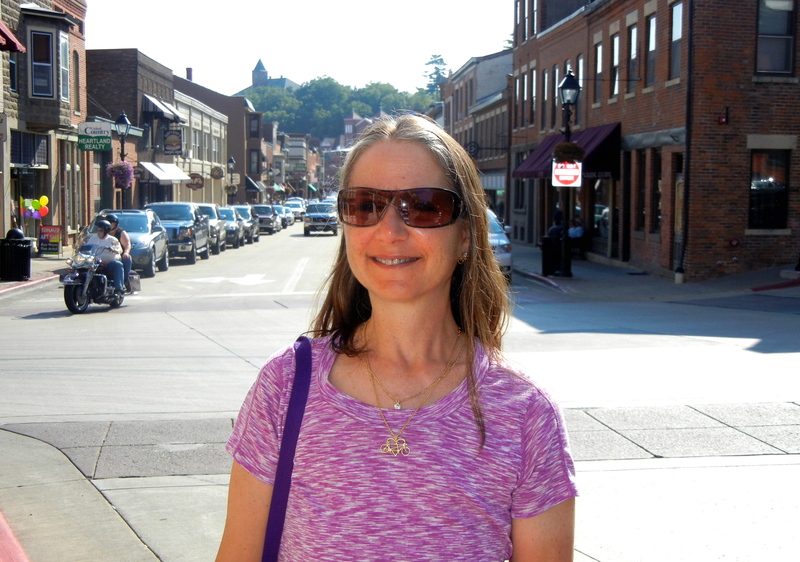 Galena has a huge downtown, and we walk up and down the streets window shopping. Back at our hotel in Mineral Point, we have some pre-dinner snacks before going downstairs for dinner. Check out the raisins in the bread we got at Quality Bakery. 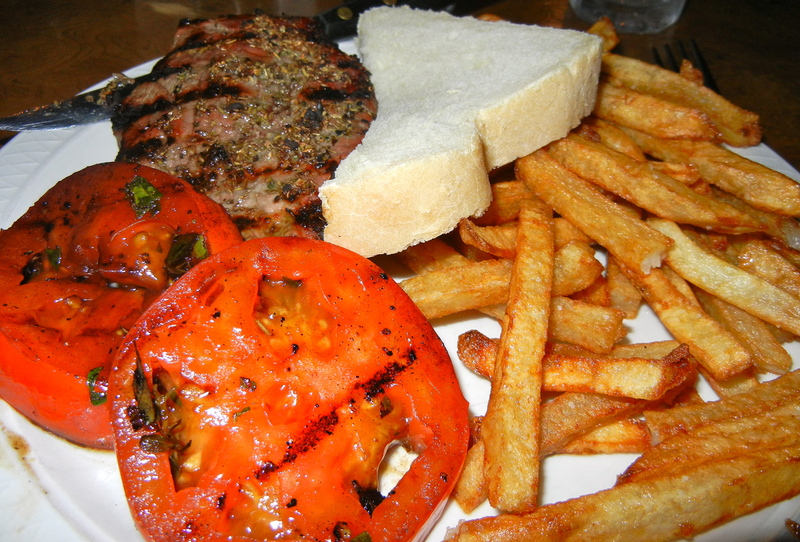 Steak with Belgian fries and marinated tomatoes. 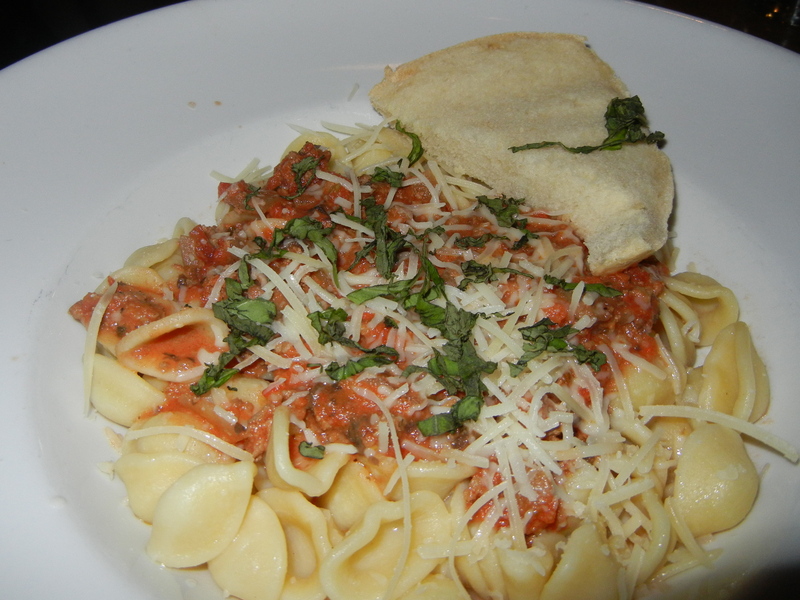 Pasta with sauce made from local sausage. 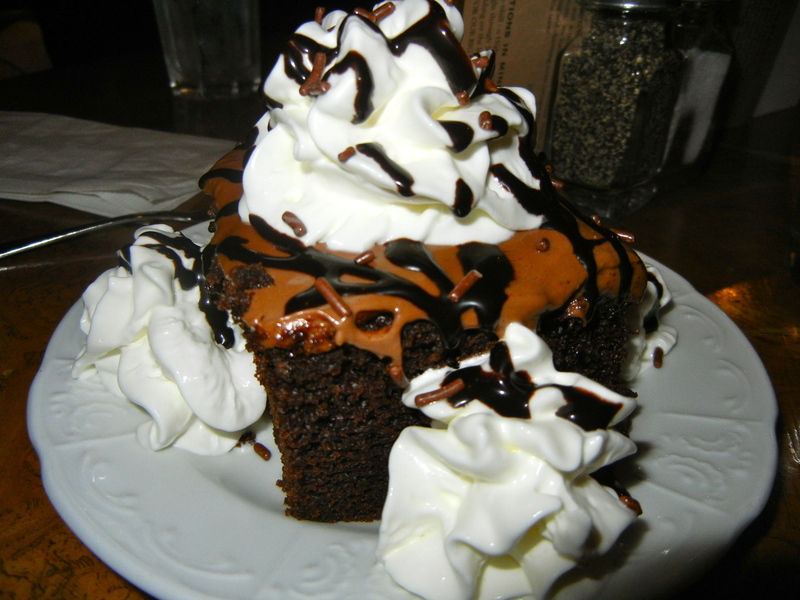 And for dessert, a chocolate cake with mocha icing as our reward for a very hard ride.